In emergency situations, conditions can deteriorate rapidly. The air is suddenly filled with smoke or toxic fumes and rapid escape is the only available option. The Dräger CF10 Escape Set is highly visible and was designed to be suitable even for people with spectacles or facial hair. When opened, the Dräger Saver CF is automatically activated and begins feeding a continuous supply of breathing air. 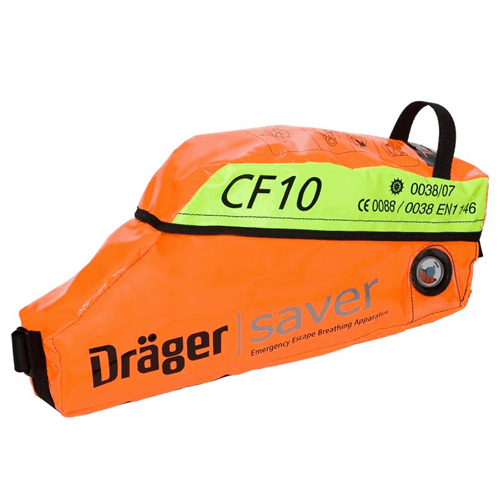 The Drager CF10 Escape Set gives the wearer the precious additional time needed to exit the area. The Dräger CF10 Escape Set utilizes a simple, fail-safe reducer system with excellent flow characteristics, providing a consistent rate of air flow until the cylinder is completely empty. An alarm whistle sounds before the air supply is exhausted. It is equipped with a cylinder which holds a 10 minute supply of air. The flame-retardant hood incorporates a large visor for maximum peripheral vision.